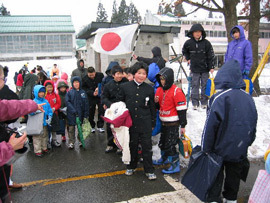 In winter, students sometimes wear winter coats over their school uniforms. Photo from Yonezawa City Misawaseibu Elementary School. The Japanese school year begins in April and ends in March and is divided into three semesters. The school year starts in April. So the first semester begins in April and ends around July 20. For most elementary, junior high, and high school students, summer vacation lasts from July 20 through August 31. There are regional differences with this schedule, however. Because summer vacation does not mark the separation between academic years, students often have homework to do and even continue to go to school to take part in their club activities during the summer break. The second semester begins in early September and continues until about December 20, when the students go on winter vacation. The third and final semester of the school year begins in early January and ends in mid-March. Each semester begins with a formal opening ceremony and ends with formal closing ceremonies. Students have midterm and final exams for each semester. In addition to academics, schools also have extra-curricular activities such as cultural festivals, field trips, and sporting events throughout the year.